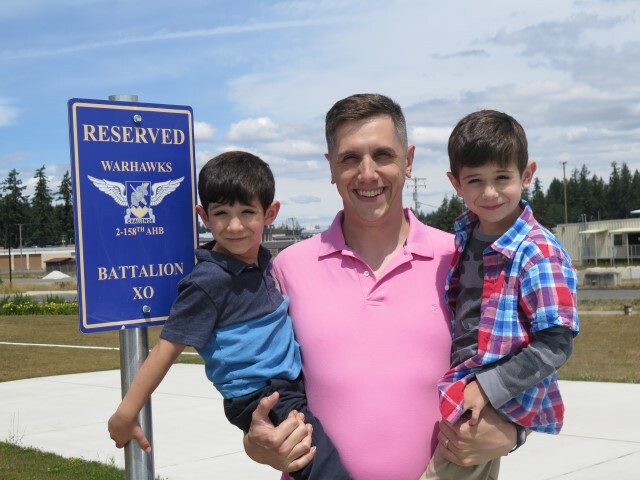 Having successfully done our part to assure the successful incorporation of Baby Michael into the household (which is to say, having done nothing but hang around for a few weeks), we had a chance to take a day for a visit to Mt. Rainier. 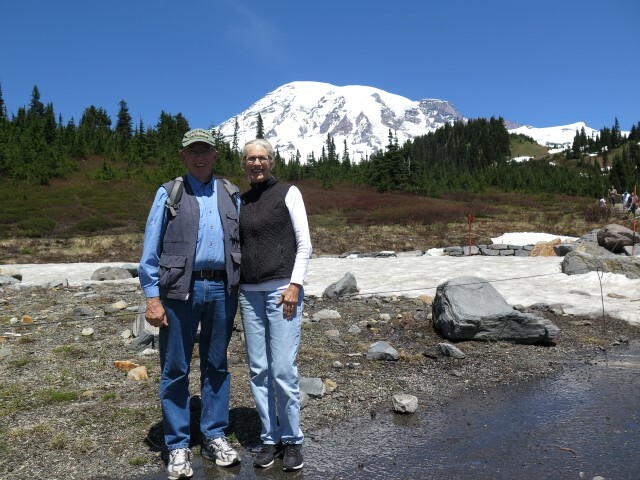 June 26: A perfectly crystal clear and warm day, great for seeing Mt. Ranier, which probably explains why the visitor center had approximately 36,000 people present. Still, the day could not have been better. Most people probably know this, but Mt. 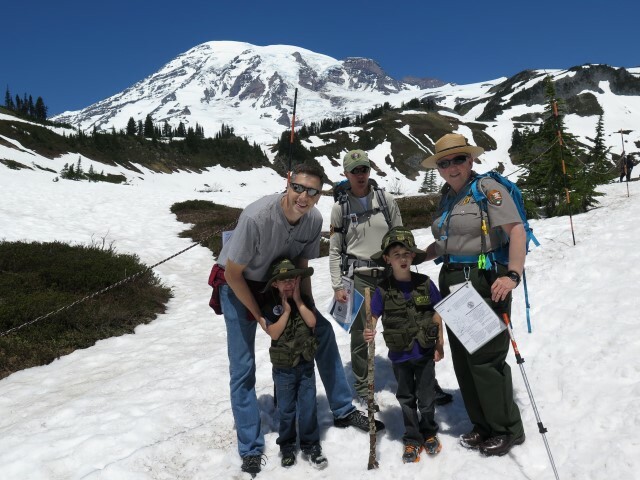 Rainier is a “dormant,” not “extinct,” volcano. Which means that, at any moment, it could erupt, unleashing “pyroclastic flows” consisting of volcanic ash, lava, hot rock, and volcanic gases. All of that would be accompanied by mud flows, hundreds of feet high, traveling at 50 miles per hour, that would travel outward for dozens of miles. Most of the Seattle environs, all heavily populated, would be asphyxiated or buried in volcanic mud (take your pick). USGS says that Mt. Rainier is one of the most dangerous volcanoes in the entire world. Not to worry, though. Seattle and the surrounding area will probably be destroyed by a slip in the Cascadia Fault, causing earthquakes and huge tsunamis, long before it’s buried in mud from Mt. Rainier. I think I’m taking this place off my “lets go live there and see what happens” list. It’s probably just as well, though. When we lived in Portland, the standard joke was that the Northwest has two seasons: winter and the Fourth of July. It’s a bit of an overstatement, but not much. The weather here has been mostly cold, wet, windy, and generally unpleasant. Plus, annual surveys always list the Seattle-Tacoma area as among the worst three traffic cities in the U.S., and that is not an overstatement. I hate to sound like Yogi Berra, but this can’t be a very popular place, mostly because of all of the people here. And, on top of all of that, the politics here, well, do not comport very well with our values. The whole place seems to have a degree of leftist lunacy and oppressive government intrusion that would give California a run for its money. Georgia looks pretty good right now. Yes, most of the pathways are still covered in snow, which meant that walking around in tennies was an adventure in slip, slidin’ away. Not a problem, though, for children properly attired as Junior Rangers. 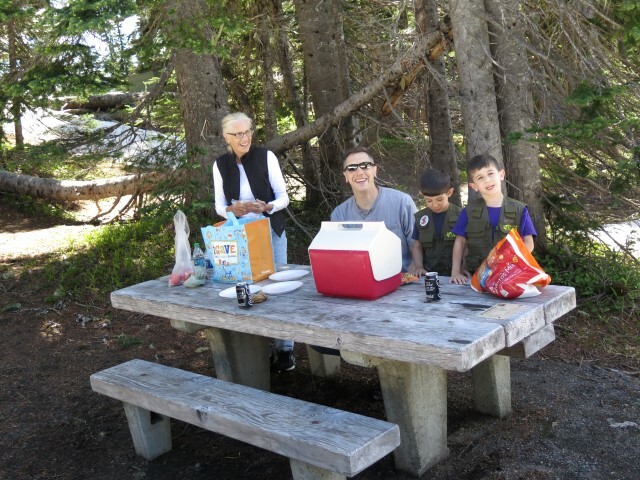 Warm enough to run just down the hill from the Paradise Visitor Center for a picnic lunch. As is so often true, this area, only slightly removed from the main thoroughfare, was largely empty. Most of our time in the Dupont area, though, was spent just hanging around family, taking the boys off of Laura’s hands so she could try (not always with great success) to get at least a little sleep and tend to the household. Hopefully it was helpful to her, and it certainly was wonderful for us. Boys in the 5- and 3-year-old categories present a challenging combination of energy, determination, charm, and spontaneous combustion that defies description. One might rightly wonder whether old geezers like us could withstand several weeks of engagement with preschool boys, but my completely impartial, unbiased, and verifiable opinion is that we did a pretty good job. Some pictures from our three-week stay can be found here: Dupont Album. These past few weeks also gave us time to reflect on lessons learned during the trip so far. The outbound trip was one of the best experiences ever. The destination stops were all wonderful, even more so than we ever could have thought. 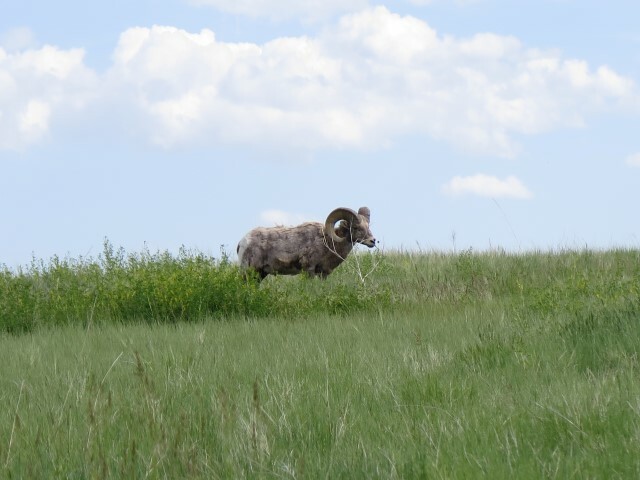 For me, the Big Five (Badlands, Mt. 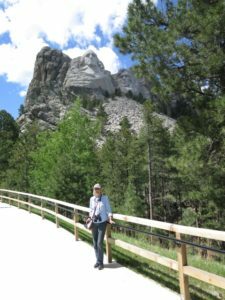 Rushmore, Black Hills, Devils Tower, and Little Big Horn) were all firsts, and memories of those stops will stay with me forever. 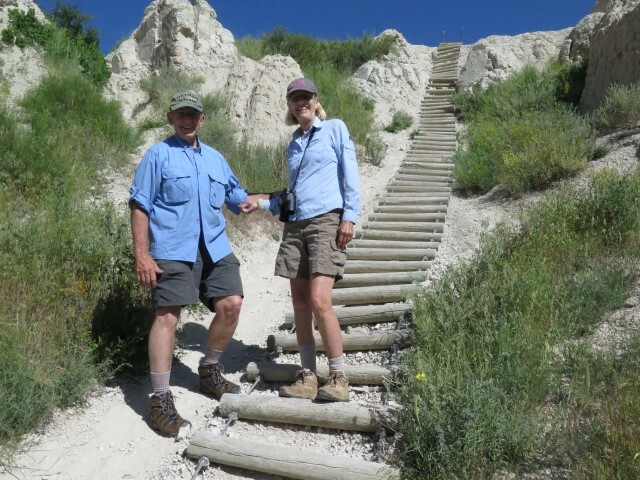 We would have liked to have stayed an extra day in Badlands, maybe a half-day less at Little Big Horn, maybe a few days with more miles, maybe a few with less. Overall, though, and much to our surprise, there were no major whiffs by the Department of Planning and Itineraries. 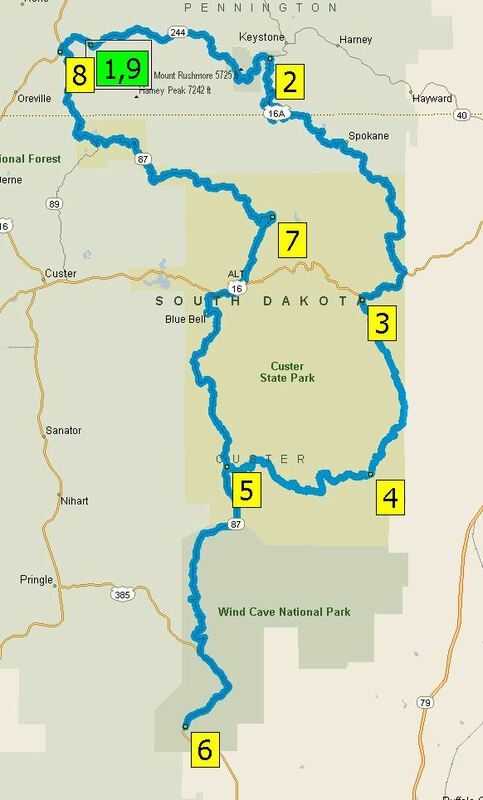 The route basically just tracked Robert’s PCS trip from last year. It’s interesting to read the two accounts side-by-side. Our evaluations of the stops along the way are similar, except that, as one would expect, traveling with a 4-year-old ad a 2-year-old caused him to rate campgrounds differently. Also, we were spared the experience of vomiting children along the way. Our little motorhome, the RV-equivalent of a VW beetle, works just fine. We’re comfortable living in it for extended periods; the living, sleeping, and bathroom-shower spaces are all more than adequate; it handles long mountain climbs and descents just fine; and it holds enough food and supplies that we can eat all of our favorite meals (and eat healthy). The 3:00/300 rule (off the road by 3:00 and no more than 300 miles per day, whichever occurs first) worked well, except that we found we can push hard (over 400 miles per day) if we have to. Still, though, that’s not our preference. Generally, 3:00/300 it will be for the return trip. People say that the journey is as much of the experience as the destination, and that is surprisingly true. Each of driving-days, just putting on miles, was fun and well worth it in itself. In part, that may have been because we were listening to Undaunted Courage as we drove, and frequently the narration coincided exactly with the view out the window. 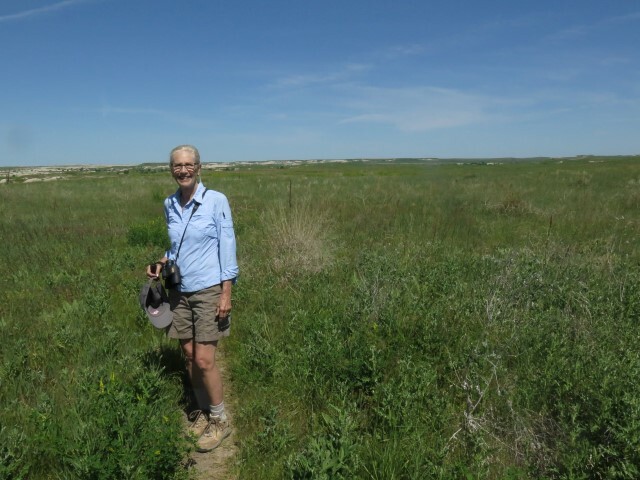 But even long stretches of prairie and farmland were fascinating and the hours flew by. 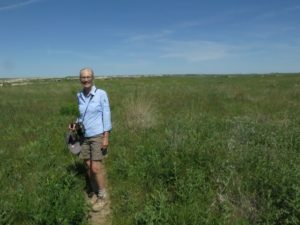 In eastern Washington, the farmland was especially enjoyable after we saw a sign that said, “Crops Identified on Fence Line–Next 14 Miles” and spent the drive learning to recognize all those acres of leafy things that you never know what they are. Still, as good as the trip was, two-plus months on the road makes it easy to get homesick. Not sure what to do about that. Something to ponder as we plan future trips. Traveling with dogs is, well, complicated. Our little doxies are cute and we love them, to be sure, but they significantly limit our options and increase the workload as we travel. We’ll probably have them put to sleep before we return. And what of the “campground” where we’re staying during our family time? Imagine an old drive-in movie theater lot, leveled and covered in gravel, where those poles that held up the speakers are now used to plug in the RV. It’s tolerable (barely) for what we need (a place to park ACE giving us a way to sleep at night), no worse than staying in a nearby hotel I suppose, but that’s about all a place like this is good for. So, tomorrow it’s off to Olympic National Park and the start of the return trip. Further posts to follow. This entry was posted in Travels on June 30, 2016 by skiprd. In the annals of American history, there are events that mark breaks in the trajectory. For many of us, the assassination of President Kennedy was one. Something spun out of control in our history at that point, launching the sixties, and setting us on a course that made us a different country than we were previously destined to be. One of my favorite books, Coming Apart by Charles Murray, shows how every aspect of our country’s founding values (in terms of religion, marriage, hard work, honesty, and so on) started to change for the worse at that point. For that reason, one destination on my bucket list is Dealey Plaza, just to see the physical place where the event occurred that changed us forever. In the nineteenth century, one can make the point that a similar breakpoint occurred with the Battle of Little Big Horn. As Stephen Ambrose made clear in Custer and Crazy Horse (which I read especially for this trip), America was on a cultural collision course with native Americans. On the one hand was an industrious and industrial, productivity-minded, land-owning, free enterprise culture, undergoing an explosive growth in population, and on the other was a primitive culture that appeared to Americans as indolent and backwards. 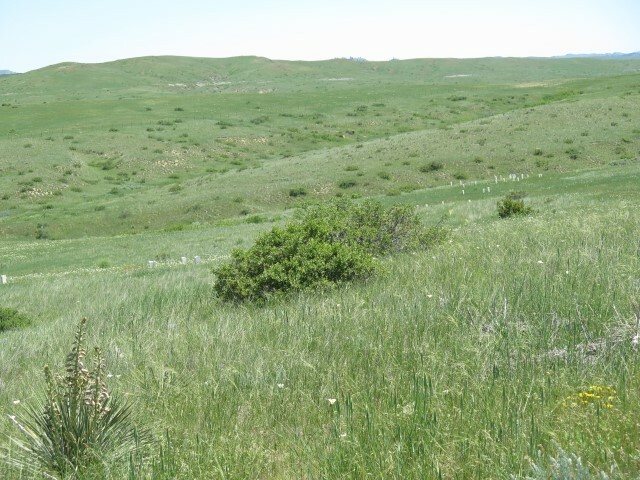 What was to become of the Great Plains, for example? 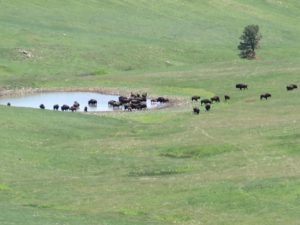 Use them for farmland and ranches to feed a growing population, building wealth for future generations in the process (the American imperative), or leave them unused as nothing but rangeland for wandering buffalo (the native American alternative)? The clash kept recurring, with a result that one “arrangement” after another would be made between American settlers and native populations, with the arrangements not working out very well for either side, and with both sides (not just the Americans, in my view) repeatedly violating the agreed-upon terms. Something eventually would have to give. My suspicion (which I admit may not stand up to scrutiny by knowledgeable historians) is that both sides knew the process was futile: despite all of the treaties, the various peace delegations, splits in factions on both sides, everyone probably knew that one side was going to win and one side was going to lose. Ultimately, there would never be a middle ground. 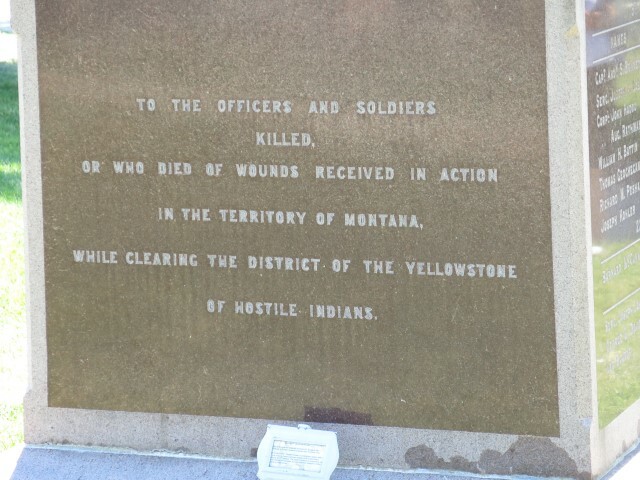 In that context, on June 25, 1876, a force of maybe 2000 Sioux and Cheyenne Indians, led by Sitting Bull as the diplomatic leader and Crazy Horse as military leader, encountered the 7th Cavalry Regiment under the command of Lt. Col. (brevet Major General) George Armstrong Custer. The rest, as they say, is history. When word of Custer’s defeat reached the East, ironically in July 1876, right at the moment America was celebrating its centennial, relishing it past successes and giddy over its future prospects, the fact that Indians had defeated one of America’s most celebrated heroes was more than the country could stand. One can almost hear a collective response, “OK. That’s it. Enough is enough. Let’s put an end to this once and for all.” As a result of that battle, large military forces were sent west, and within a few years Crazy Horse was dead, Sitting Bull had surrendered, and the west was opened for America’s “Manifest Destiny.” It reminds me of Pearl Harbor. In a way, the enemy may have “won,” but that hollow victory unleashed forces that would leave the “victor” utterly destroyed. So, here we are in the very place where that shift in the historical trajectory occurred. And besides its historical significance, it’s also a military memorial, a national cemetery, a place where American soldiers fought and died. In all ways, it is for me a place that is both dramatic and holy. Atop “Last Stand Hill,” looking down towards the Visitor Center. About 5 miles to the south were Reno and Benteen. Through a massive program of GPS mapping and archeology, the place where each soldier fell is relatively well known and is marked by a headstone. 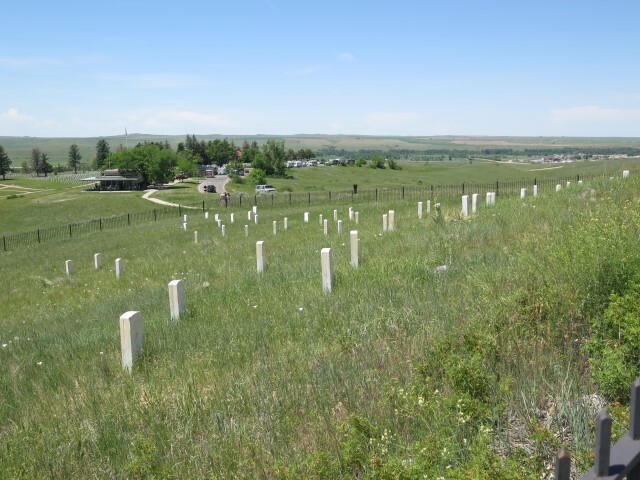 Some of the headstones bear names, but most just say, “A soldier of the 7th Cavalry fell here.” The national cemetery is visible just past the Visitor’s Center. The ravine in which Calhoun’s forces were trying to move to link up with Custer. It’s not really clear from this photograph, but one can see how Calhoun’s troops were using classic fire-and-maneuver tactics, with a series of headstones marking each place where they stopped to provide fire and were overwhelmed. All of Calhoun’s forces were killed. 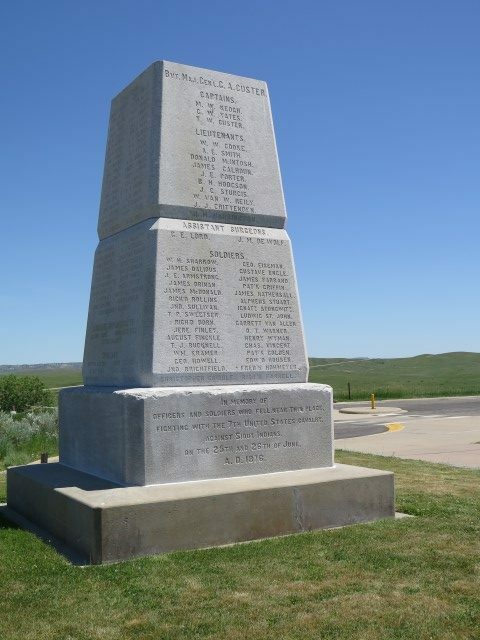 The memorial erected atop Last Stand Hill, I believe in 1881. It marked the place of a mass grave, commemorating the place where 249 soldiers were buried. Some of the bodies were later relocated. Custer is now buried at West Point. One final thought: Both Wendy and I were a little nervous about seeing the National Battlefield Monument. Our tour guide was a Crow Indian, there is the recent (2003) “Indian Memorial” at the monument, and as one would expect in these times, much of the narrative here extolled the virtues of native American culture. But overall, our fears were unwarranted and things were just fine. 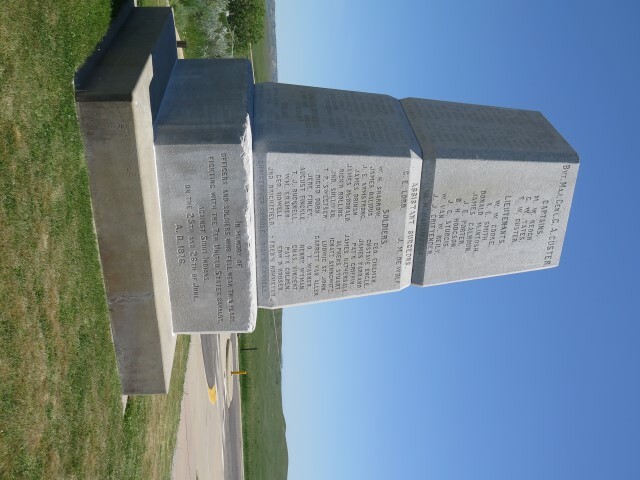 The presentations and displays very much honored the American soldiers and, although the native American perspective was included, it did so without in any way diminishing the bravery and sacrifice of the officers and men of the 7th Cavalry. And one other thing occurred to us both. There are times in history when both sides are right, where both sides are fighting for something noble. To my mind, as I listened to the presentations and pondered the significance of this battle, that was true here. Whatever the deficiencies of the Indian’s “traditional way of life,” and why I think clinging to the traditional ways was not a good choice, every culture has a right to decide for itself how it wants to live, and an insistence on the right of self-determination is a noble ambition. Here, I think, both sides are worthy of honor, and the Monument does a good job of doing that. So, that’s about it for the special stops on our way out west. We now have three days of pedal-to-the-metal travel (which means creeping along at 60 miles per hour for us old people) before we arrive at Robert’s. We’ll post some concluding thoughts when we get there. This entry was posted in Deep Thoughts, Travels on June 7, 2016 by skiprd. 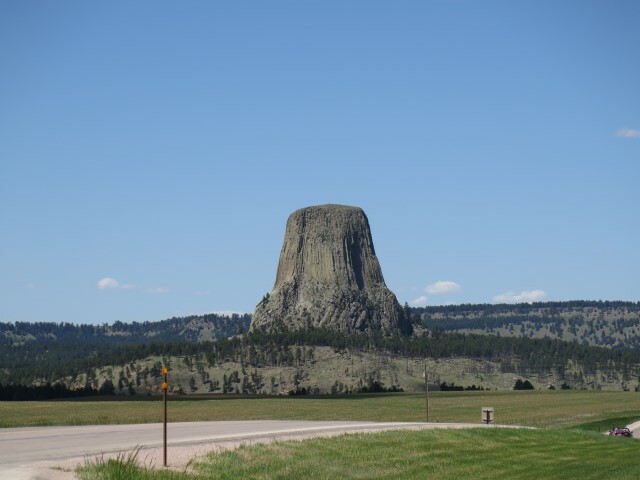 I wasn’t really expecting much from our stop at Devils Tower. 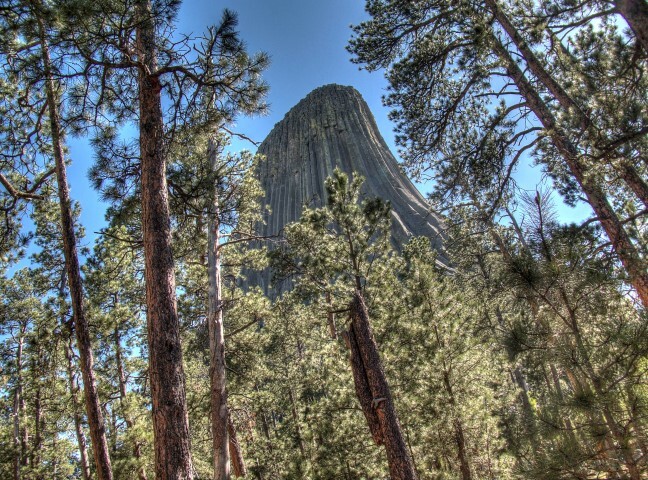 Devils Tower is a really big rock thingie and sort of interesting in a way, but what else is there except to see it? Make the stop, see the tower, take the picture, and mark the checklist. That’s it–time to leave. But I began to change my mind as we approached. From miles away there stands this stark, improbable column rising above the plain. The scene is so dramatic that the highway scenic turnouts start about 10 miles away. And immediately, one begins to wonder. How could such a thing come to be? What is it like on and around that unlikely object? So, after setting up at the campground (directly at the entrance gate to the National Monument), off we went to explore. And here’s what we found. In a way, it is just a big rock. But it’s so big, and so vertical, and so different from the surrounding area, that it has a near-hypnotic power to command attention. One can’t help but to stare at the image it presents and be lost in the mystery of it. Plus, that effect changes as one walks the 1.3-mile hike around the base. The north side, almost always shaded, is captivating in a way that the south side, way too bright for something so dark, is not. Different kinds of trees grow in different areas around the base, and frame the tower in contrasting ways. The effect is best illustrated, perhaps, by the fact that everyone walking the trail, including us, stops every few hundred yards to take another picture looking up at the rock. Why? How many pictures of a tower can one take? Does it really demand another picture every few steps? Yes, because the tower’s effect renews in different ways at every turn. No wonder the Indians thought this place has magical powers–it does. So, we’re surprised at how glad we are that we made this stop. The campground is fun, even though we missed the hayride through the adjacent cattle ranch, and we were too tired to stay through the entire showing of Close Encounters of Third Kind, activities the campground does every night. And, to be sure, a half-day is probably enough. But this is also more than a stop enroute to somewhere else. Surprising as this may sound, if we ever pass this way on some future trip, I’d be inclined to make the visit again. It’s that kind of a place. This entry was posted in Travels on June 7, 2016 by skiprd. Having been humbled and inspired by Mt. Rushmore, we took the next day to explore the surrounding area, learning once again that sometimes the things we don’t plan work out better than we ever could have planned. Go figure. 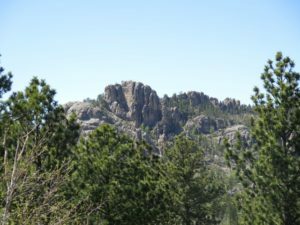 We left the campground and headed into Keystone, then through the Black Hills National Forest, over the Iron Mountain Road section of the Peter Norbeck Scenic Highway (Route 16A). 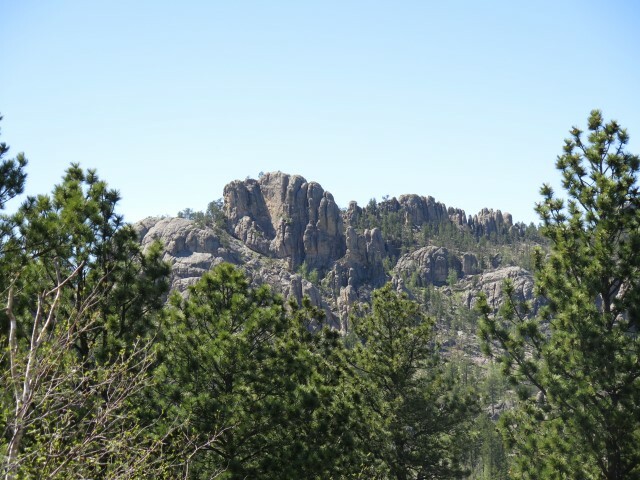 From there, into Custer State Park, taking the “Wildlife Loop” road, down into Wind Cave National Park. Then back up to the Needles Highway section of the Peter Norbeck Scenic Highway (Route 87), and then back to the campground. Overall, it took us about 8-1/2 hours to travel almost exactly 100 miles. The route was basically one recommended by some random guy we met at some now-forgotten campground, which means it was anyone’s guess as to how this road trip would work out. stopping just short of saying “Ignore These Warnings and Die.” And what followed was one spectacular vista after another. 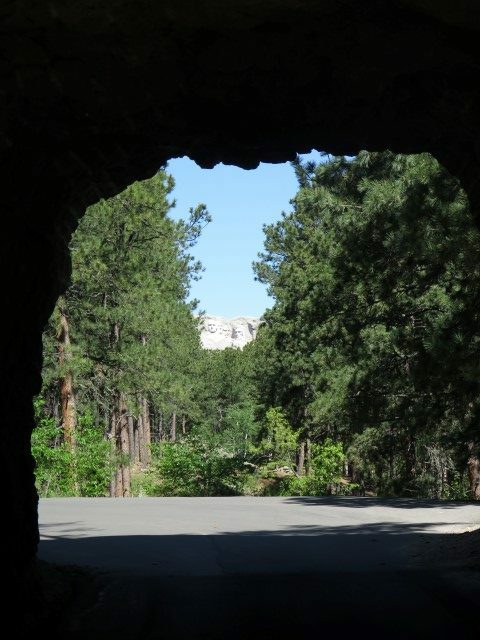 And, and this cannot possibly be a design accident, each of the narrow tunnels, no more than eight feet wide and ten feet high, pointed at and perfectly framed Mt. Rushmore. We found ourselves back to a world where things like this just don’t happen in real life. 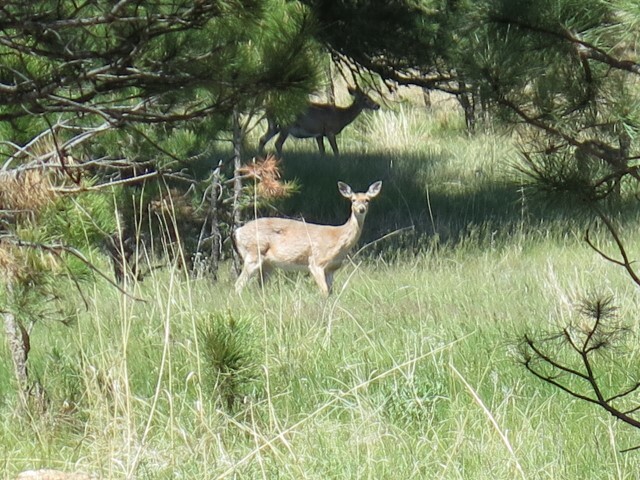 Then we entered Custer State Park and, after paying the $20 entry fee, turned onto the Wildlife Loop. 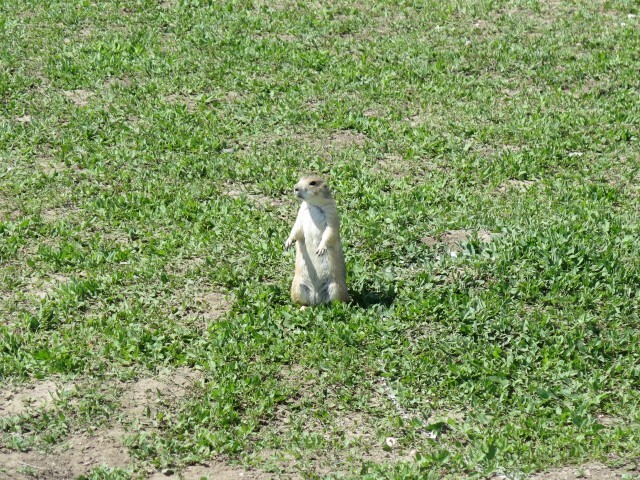 Although we love watching wildlife, and can do so for hours, we generally are not wildlife gawkers. In fact, the long lines of traffic jams in Yellowstone, with hundreds of cars stopped to look at a buffalo, are just not the way we like to spend our time. 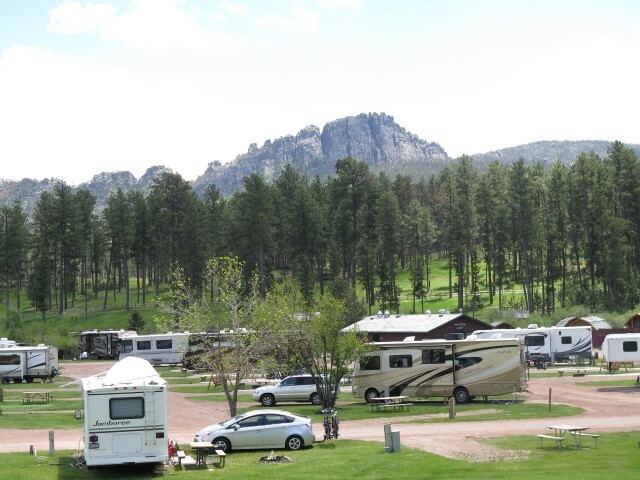 But Custer State Park was different. Wildlife was everywhere–bison, pronghorn, and deer–but without long lines of stopped cars and with all of the wildlife roaming freely in their natural settings. 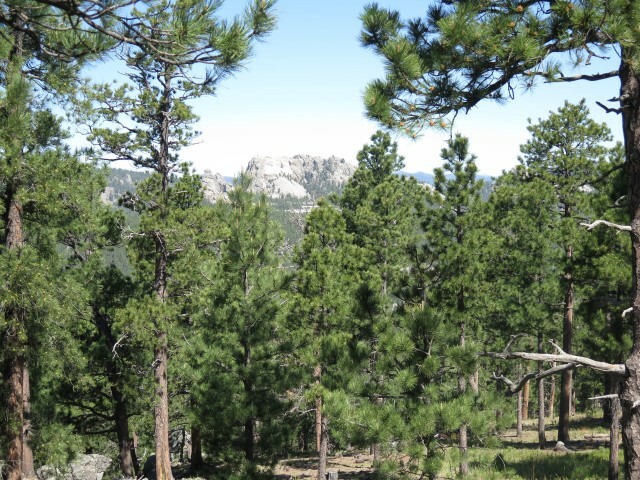 Then it was down to Wind Cave National Park. More buffalo. Lots of ’em. Ho hum. 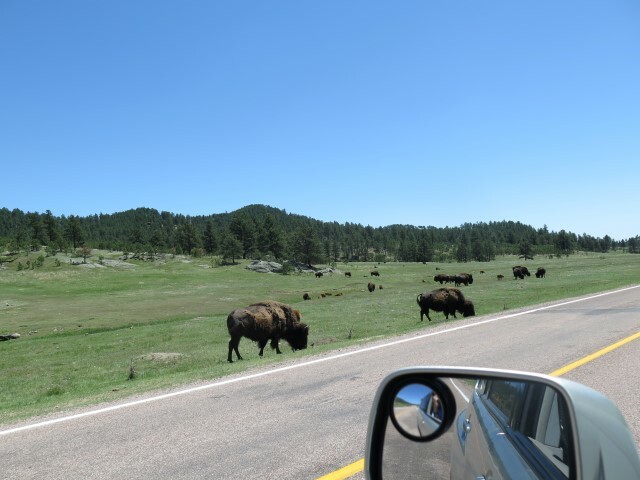 Although we did have one exciting moment when a herd of buffalo on the road in front of us got spooked by an oncoming car, turned around, and stampeded by us. Snorting and darting left and right on either side of our car. That was memorable. As to the National Park itself, it was not much to see, at least above ground. Supposedly it’s a long and complicated cave system, one of the longest in the world, but it’s closed to the public except for a few short tours, none of which did we have time to do. So we stopped for a picnic lunch and headed out. 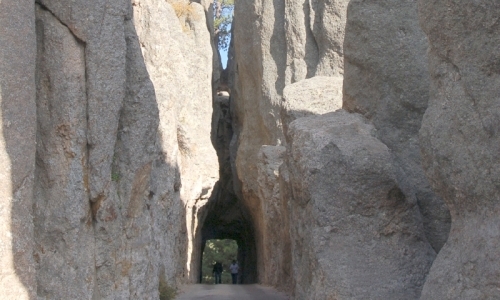 Next was the Needles Highway. …mile after mile of it. Tight, twisting turns, pull-outs for awe-inspiring vistas, and with the occasional impossible tunnel thrown it for good measure. So, back to that random guy from some forgotten campground: thank you. 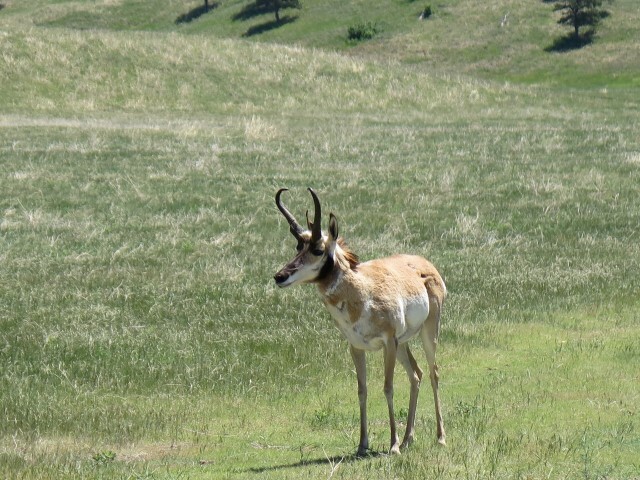 The recommendation was perfect, something that easily compares with any of the national parks in Wyoming. And that ended our stay in the Black Hills. And what of the campground itself? It’s hard to rate. On the one hand it’s in the middle of some spectacular terrain, only minutes from Mt. Rushmore and miles of spectacular motor-touring. The facilities are excellent and the staff is helpful. But, there was something wrong with the place. It was too much like Panama City beach, with putt-putt miniature golf, trampolines, water slides, ATV rentals, and even tie-dye t-shirt crafts. In some cases, things like that might add to the enjoyment, but here, amidst everything else there is to see and do, such things, as Wendy pointed out, somehow subtract from the experience. Would we stay here again? I doubt it. Especially if we had the Little Darlings along with us, we’d find something more compatible with area. I would hate for anyone to leave this area with memories of putt-putt golf. This entry was posted in Travels on June 5, 2016 by skiprd. Mt. 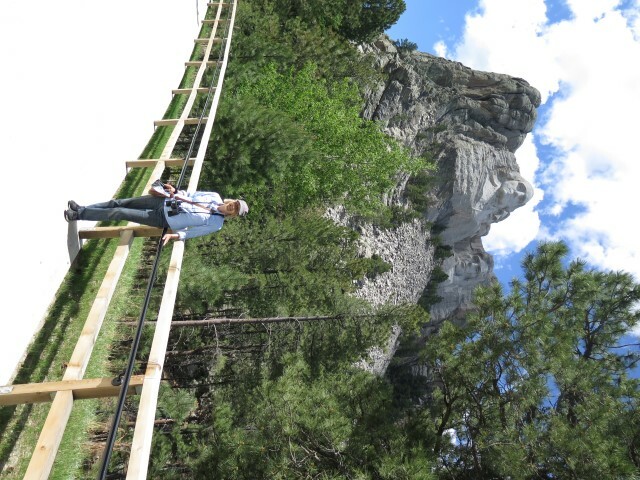 Rushmore, as a scenic view, is so well known that, although we took approximately one hundred photographs, none of them, except for our presence in the images, show anything not seen countless times before. What photographs do not show, though, is the reason that Mt. Rushmore even exists, something I guess I had never really paused to consider. 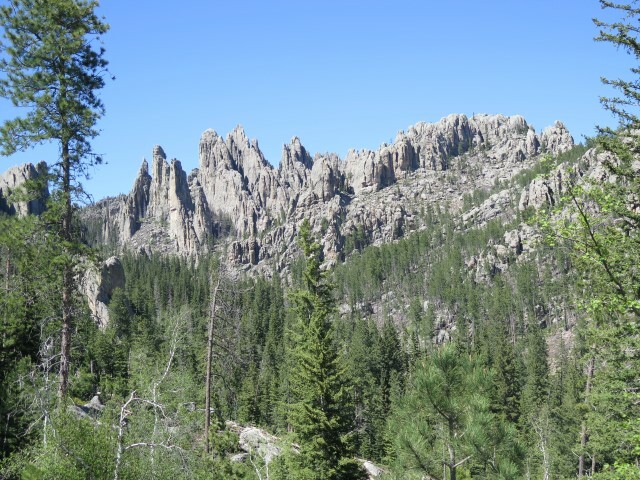 Unlike other national monuments that exist to preserve physical beauty, or as a refuge for wild animals, Mt. Rushmore exists not to restrain certain human tendencies but to celebrate and encourage certain human tendencies. Mt. Rushmore’s mission is patriotism, but not in some simplistic form of nationalism. It is based on the concept that there really is something unique about American ideals, and Mt. 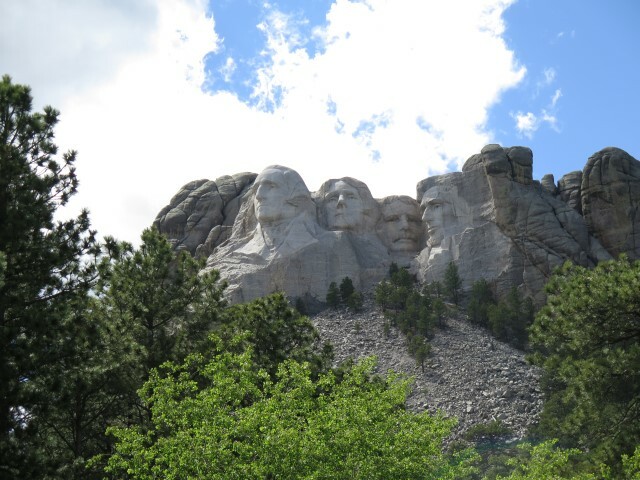 Rushmore depicts four presidents each of whom, in ways that are different but complementary, assured the success of a grand American experiment. It is, in essence, American exceptionalism carved into stone. Through dozens of exhibits and lectures, this theme emerges. The connection of Washington and Jefferson to American ideals is obvious. “We hold these truths to be self-evident, that all men are created equal, that they are endowed by their Creator with certain unalienable Rights…,” and that governments derive legitimacy only by “consent of the governed,” were radical views then and probably only slightly less radical now. Catherine Drinker Bowen’s Miracle At Philadelphia made a point that has never left me: the American revolution was the only revolution in history instituted not by the “have-nots” but by the “haves,” privileged people who had everything to lose and nothing to gain except fidelity to what they viewed as a moral duty to pledge their lives, their fortunes, and their sacred honor to philosophical principles. The exhibits at Mt. Rushmore also make the point that Jefferson actually gets double credit, adding to his role in the founding of the country the accomplishment of doubling the size of the country by one stroke of the pen, expressing his commitment that the American experiment would apply not just in lands originally signing on in 1789, but by projection to everywhere that American influence could come to bear. Teddy Roosevelt’s entitlement was less clear to me, so upon arrival I asked the ranger. What he told me, and then what we saw again and again in the exhibits and displays, is that Roosevelt embodied that idea that American ideals would survive only if manifested in action. Everything that Roosevelt did, from the “trust busting,” to the expansion of American military power, to the brokering of peace accords, and even conservation of precious national resources, was based on his view that ideals are too fragile, too easily lost in the pressures of unrestrained commerce and other forces, to be left to carry on only in the abstract. 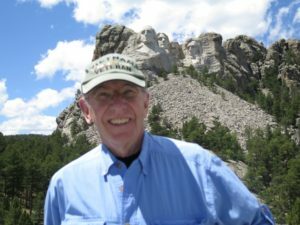 The essential democratic nature of national parks, for example, was not just a few spectacular vistas; there needed to be tangible preservation in thousands of instances (230 million acres to be precise) making it plain this is our country, our land, and we, the people, own it for our benefit and the benefit of our children. Over and over again, these themes came through. But it wasn’t just the exhibits and displays. One more thing. 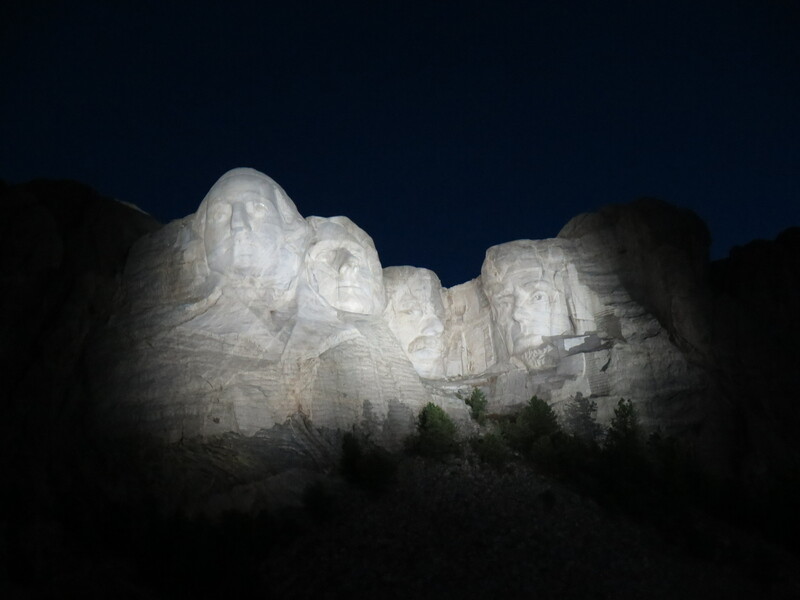 Every night, there is an “illumination ceremony,” where there is a powerful symbol: in the stark blackness of the universe, while “American the Beautiful” plays in the background, a light shines suddenly on the men who created, preserved, and assured the success of the American ideals. At the conclusion of that, all members of the military, active and veterans, are invited to come down to the stage for the lowering of the flag. The ranger, a former Marine, announces to the audience, “Ladies and Gentlemen, these men and women were willing to put their lives on the line for the sake of American ideals expressed by these presidents, and we should honor them for that now.” The entire audience applauded, really, as the a few dozen veterans made their way to the stage, and after the colors were retired, each veteran was introduced to the audience by name, branch, and rank. This entry was posted in Travels on June 4, 2016 by skiprd. We’re here, and all I can say is that this place is fake. Really, it’s not an actual, natural, environment. It’s a fabrication done by some anonymous author who thought it would be fun to make a weird and synthetic landscape. 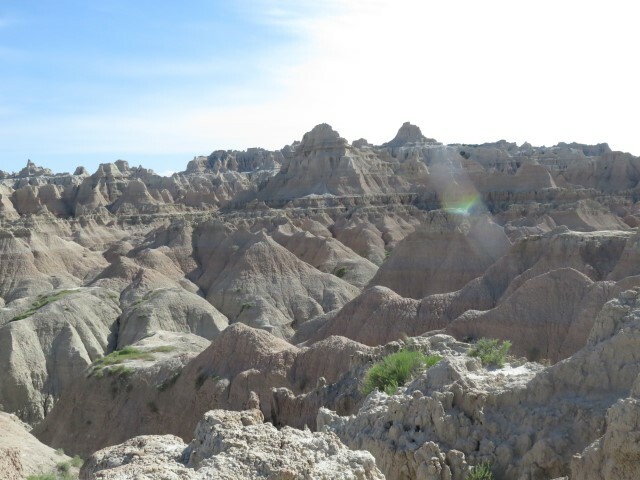 Even the National Geographic guidebook to national parks says the same thing, describing the sights presented by the Badlands as “theatrical.” Exactly. Like the matte for a 1950s, grade-B, science fiction film, like maybe Amazon Women From Venus or something. Imagine a 100-mile long block of rock, consisting of layers of sedimentary deposits and volcanic ash, eroded at breakneck pace (at least by geological standards), up to one inch per year, over a very short period of time (500,000 years), leaving hundreds of thousands of fantastic ridges, cliffs, pinnacles, and gullies. 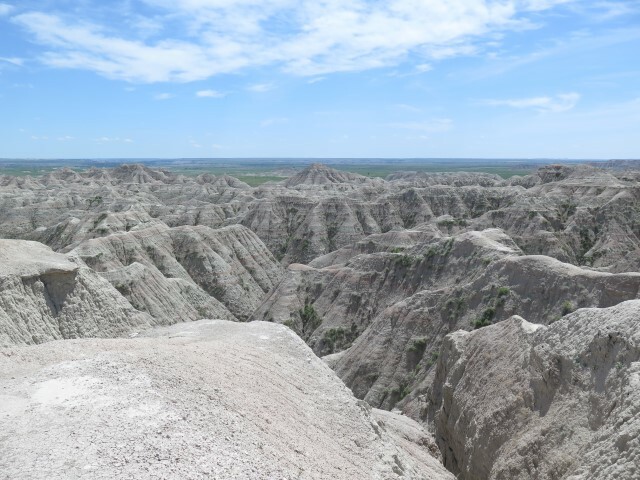 The Badlands starts suddenly on the plains, so suddenly that explorers to the north didn’t even know it existed, and disappears just as suddenly. And the geological process is so rapid that in another 100,000 to 500,000 years it will all be gone. Imagine miles and miles of this, plopped down in the middle of the prairie for, as near as we can tell, absolutely no good reason. 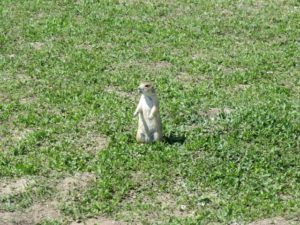 So, after setting up at the Cedar Pass campground, we traipsed off to the visitor center, learned about this strange and awe-some place (hyphenated to convey the actual meaning), and then spent the afternoon exploring the area. 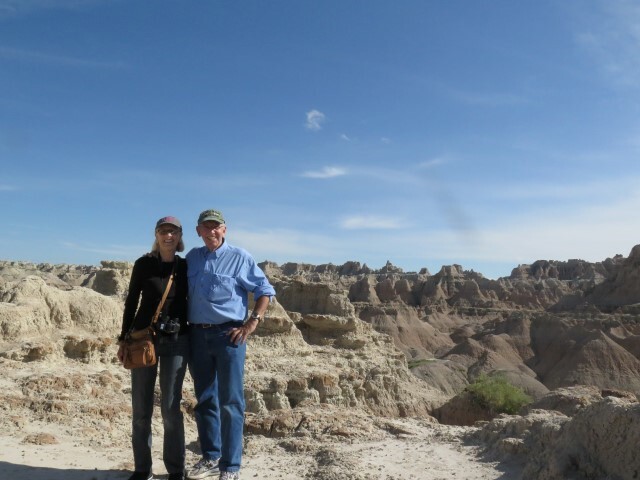 In the Badlands, discovering once again an unexpected but fortuitous truth of exploring national parks. At this point we are only 800 meters (one-half mile) scrambling on an easy rock trail from the end of the Door Trail boardwalk, and we basically have the place to ourselves. National parks are “crowded” only along narrow strips adjacent to roadways. Go figure. That night it was off to the evening ranger program on archeology in the grasslands, and then, still trying to adjust to the mountain time zone, and still exhausted from driving the profile-equivalent of a billboard for 250 miles in winds at 20 mph, gusting to 30, we collapsed, happy as ever to be in such a strange and wonderful place. 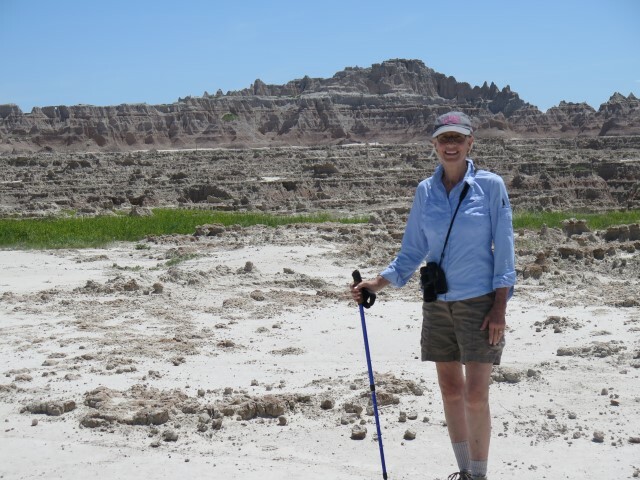 Then it was a 4.1-mile hike out into the grasslands, although even on that footpath, we found ourselves meandering through what might be called “badlands in the making”: rapidly eroding terrain creating deep gullies. 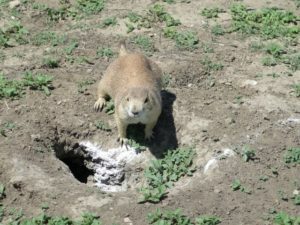 Then, after lunch, it was a driving tour around the rest of the park, where we saw bison, pronghorn antelope, bighorn sheep, and, of course, countless prairie dog towns. Maybe it’s just me, but the upper row of spires looks a lot like a Gothic cathedral’s depictions of a line of saints. Or maybe this is what happens to people after a few days in the Badlands. Then, just to confirm the theatricality of the whole experience, as we left the park and found ourselves stopped at a road constructions site, someone (either the Park Superintendent or God, I’m not sure which), arranged for a small group of bison to pose in a nice lineup at the entrance sign. 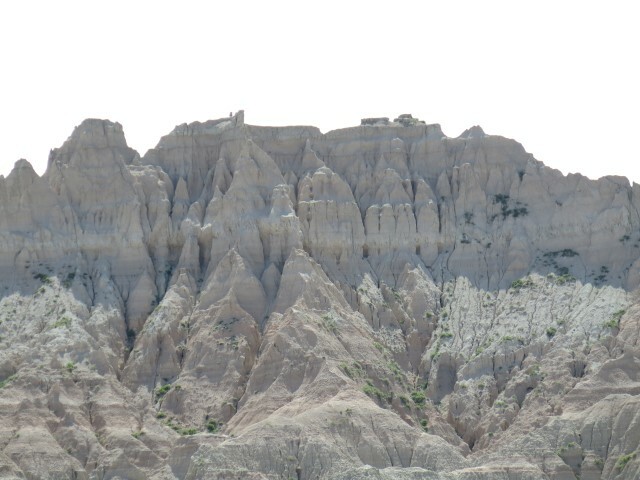 So that ends the Badlands portion of the trip. But first, one small digression. Once again we are struck by the nature of the camping population: lots of young couples camping in tents, families in pop-ups (including one with FOUR boys all aged five or under, which is way too many boys by anyone’s reckoning), tourists in rented Class C’s, and old farts like us in motorhomes, ranging from smallish (like ours) to full-sized luxury units. Everyone is out, hiking and exploring the area, being captivated by the ranger talks, and chatting with nearby campers, comparing experiences. It’s a whole subculture, mostly of families. We recently watched the Ken Burns National Parks series, and one recurring theme of that series struck a chord with us: time and again, the commentators remarked that they came to love the outdoors because their parents or grandparents took them camping, and they’ve taken their children, and now the grandchildren are going too. 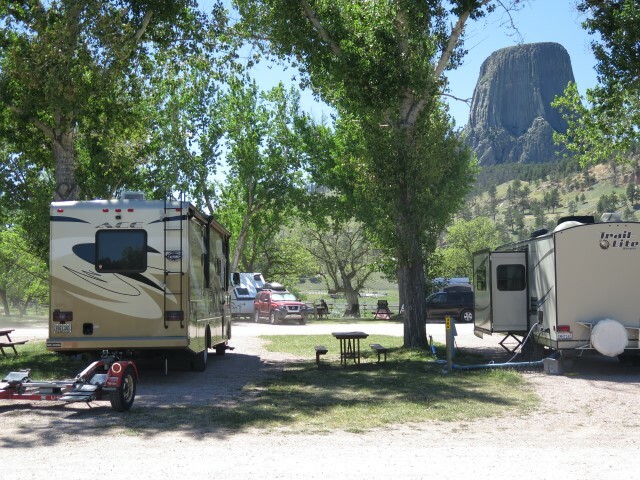 So, looking around us we don’t see so much of a campground as the continuation of a legacy, and it warms our hearts. Tomorrow we’re off to Mount Rushmore. Further posts to follow. This entry was posted in Travels on June 2, 2016 by skiprd.